This fascinating space wallpaper reveals a nearby star that at first glance looks like it is older than the universe. This "Methuselah star," cataloged as HD 140283, could be as old as 14.5 billion years. This fascinating space wallpaper reveals a nearby star that at first glance looks like it is older than the universe. 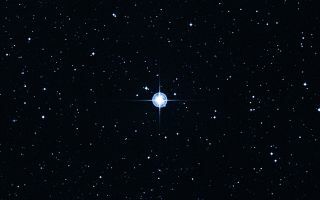 This "Methuselah star," cataloged as HD 140283, could be as old as 14.5 billion years (plus or minus 0.8 billion years), which at first glance would make it older than the universe's calculated age of about 13.8 billion years, an obvious dilemma. The recent Hubble age estimates reduce the range of measurement uncertainty, so that the star's age overlaps with the universe's age — as independently determined by the rate of expansion of space, an analysis of the microwave background from the big bang, and measurements of radioactive decay. This image was released March 7, 2013.